Want to win your NFL pick’em contest or confidence pool in 2018? Here are seven games from the Week 1 slate that you need to have on your radar screen. By considering not only the win odds but also the expected pick popularity of every team, you will give yourself a much better chance to win a season and/or weekly prize in your football pool this year. The only way to win an NFL pick’em contest is to outscore your opponents. And the only way to outscore your opponents is to get picks right that they get wrong. As a result, to maximize your edge in a football pool, you need to identify opportunities to “fade the public” in a way that increases your odds to win a prize. If your primary goal is to win weekly prizes in a season long pool, or if you’re playing in a pool that only offers weekly prizes, making some highly unpopular picks can greatly increase your expected profits. During the weeks when you catch a little luck and hit some of those highly unpopular picks, you stand a great chance of having the best weekly score. Pools that only offer end-of-season prizes, on the other hand, tend to reward more conservative pick making — especially in the early weeks. Even so, picking the less popular team in a toss-up game will give you an expected boost. Furthermore, if you find yourself trailing the leaders toward the end of the season, picking small underdogs that are underrated by the public often gives you the best chance to catch up. This week’s analysis of win odds and pick popularity yields seven picks of particular interest. Keep in mind, however, we are not saying you should make all seven of these of these picks. The best picks for your specific pool depend on a number of different strategy factors, such as the number of entries in your pool; whether it uses confidence points; and whether it offers season prizes, weekly prizes, or both. We built our Football Pick’em Picks product to do all this pick optimization work for you, but whether or not you use our tools, the seven games below should be top of mind when you make your Week 1 picks in game winner based NFL pools. Note: Win odds and projected pick popularity data below may change between publication time and kickoff time. 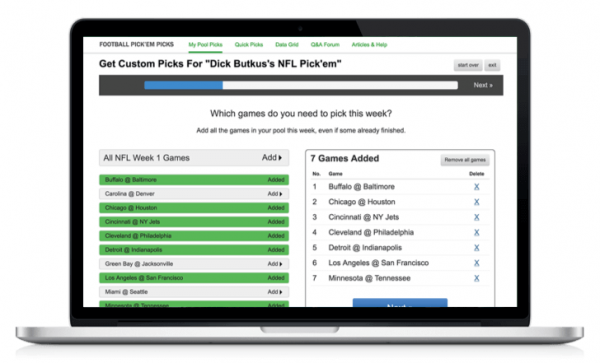 Our Football Pick’em Picks product updates multiple times daily with the latest information. In Week 1, the betting markets favor six teams to win by six points or more, with each team having win odds in the 70-80% range. Bigger favorites are almost universally overrated by the public, for two reasons. First, many people assume these games are “locks” for the favorites, when in reality a 4-in-5 or 7-in-10 chance to win is far from a lock. Second, many people can’t imagine that picking a larger favorite to lose would ever be a sound strategy in pools, when in reality it sometimes is. Out of this week’s safest picks, though, Baltimore looks like the most fairly valued of the bunch. The Ravens have around 75% win odds as a 7.5-point Vegas favorite, and are being picked by 91% of the public; that spread between pick popularity and win odds isn’t too bad for a TD favorite. So if you want to make a big upset call this week, do not make it the Bills. You can take less risk for more potential reward with other upset picks. The Chargers are 3.5-point favorites at home against the Chiefs, giving LAC about 62% win odds. Yet only 60% of the public is picking them. That’s always a fairly rare case for favorites of more than a field goal, so in short, this is not a game where you should make an upset pick. Compared to Kansas City, Cleveland, Oakland, and the NY Giants all have similar odds to pull off Week 1 upsets, and all three of those teams are significantly less popular upset picks than the Chiefs. Stick with the Chargers here. Denver is a team with a tarnished image after a 5-11 finish and horrible quarterback play last season. However, both our NFL projections and the betting markets expect the Broncos to improve by a couple wins this year. Seattle is just the opposite case, a team with a celebrated QB and strong public brand that’s expected to get worse in 2018. Such context often presents a nice contrarian pick opportunity, but the icing on the cake here is that Denver is actually favored to win this game, by a field goal. And given that the Broncos’ 60% win odds are higher than their 53% pick popularity, it would be silly to pick the Seahawks if you think your pool’s picking trends should line up with the national averages. After being a (Pick) line in Vegas for most of the week, Washington is now a 1-point underdog in this game, yet over 70% of the public is picking Arizona to win. We’re fairly high on Arizona’s prospects for improvement this year, but the bottom line here is that Vegas is giving Washington about a 49% chance to win while the public is giving Washington only a 27% chance. That’s a very big difference; the public is biased. With rare exceptions, picking the less popular team in a coin flip game will almost always give you an incremental edge in your pool, and the popularity difference here is stark. If these numbers hold, Washington is an obvious play in weekly prize pools, and deserves consideration in season prize pools as well. Wow, does the public hate Miami this week. Like Washington, the Dolphins are the slightest of underdogs at home, yet nearly 80% of pick’em entries have Tennessee winning. To put that in perspective, the Titans, a 1-point Vegas favorite, are nearly as popular a pick this week as the Rams, a 4-point favorite. With close to a 50/50 shot to win, Miami deserves consideration as a pick in larger pools with season prizes. However, if your primary goal is to win a weekly prize, you should almost always pick the Dolphins here. It’s not quite as good an opportunity as Miami because the Falcons are more popular of a pick (25% popularity vs. 20% for Miami) — but Atlanta still qualifies as a solid fade-the-public play. The public tends to hold last year’s Super Bowl champion in very high regard, and that often creates a value opportunity in Week 1. (You may remember what happened to the 2017 Super Bowl champion Patriots in their home opener against the Chiefs last year.) 2018 is no exception, especially with the Eagles battling a host of injury issues. As only a 1.5-point underdog, Atlanta still may be a bit too risky of a pick this early on in smaller season prize pools — though certainly not a bad play if you have the conviction — and the Falcons look like a great option to increase your edge in 1-week contests. You wouldn’t want to make this pick in a typical season prize pool, but the most underrated team in pick’em contests this week is the doormat of the NFL’s past couple seasons, the Cleveland Browns. It should surprise no one that the overwhelming majority of the public thinks that Pittsburgh is going to win this game, but Pittsburgh’s pick popularity — 90% — is extremely high given that the Steelers are only 4-point Vegas favorites. That means by picking the Browns, you’ve got nearly a 35% chance to gain ground on almost your entire pool, which is a huge reward. In a 1-week pool (especially a large one), or in pool formats where picking all favorites but making one big differentiating upset pick makes sense, the Browns offer great value. Which Of These Seven Week 1 Picks Should You Make? Maybe all, maybe most, maybe just a few. We’re not dodging the question — the reality is, it takes a lot of math to get to the right answer.